A little bit of Nutella goes a long way toward making these rich, decadent cookies. If you’re unfamiliar with Nutella, it’s a hazelnut spread made with cocoa and skim milk to create a creamy chocolatey, nutty taste. 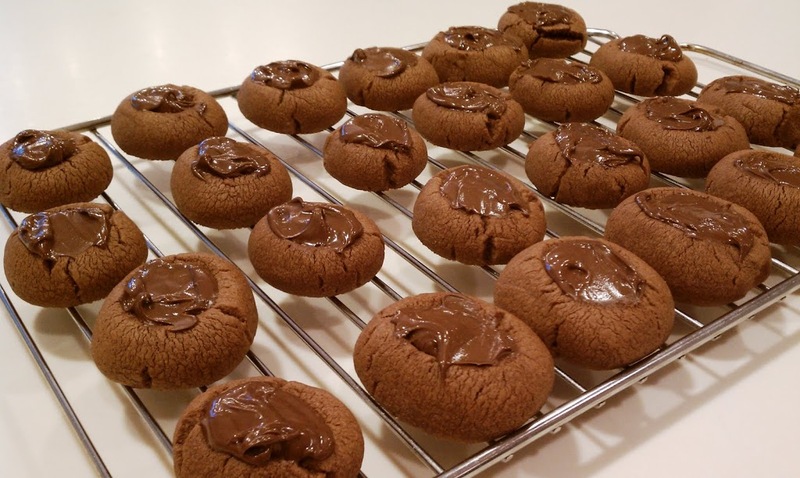 If you really love hazelnuts and you want to take these cookies a step further, the original recipe called for the cookies to be rolled in chopped hazelnuts before baking. I chose to save 1 p+ per cookie by omitting that step, but if you’d like to add them, follow the link to the original Cooking Light recipe for quantities. For 2 p+ I thought these were the perfect cookies to fend off a chocolate craving because the Nutella centers make them taste so rich that I could just eat one and feel satisfied. your version looks better than the cooking light version! I just learned about Nutella…can we say YUM! It is very addicting, I am going to make these, they look awesome! Thanks! Do you have to have the parchment paper or can you just lay them on the cookie sheet? Iam not sure what the paper does! Parchment paper is totally nonstick and allows the cookies to slide right off when they’re done. If you prefer to spray your baking sheet with nonstick spray that should work fine. LOVE nutella. Question though- normally I avoid making cookies/sweets recipes because they make such a large quantity of (delicious) sweets and are so tempting to finish off myself. Do you know if you are able to freeze the dough for future use? Would it last a month? Only a week or two? I love the idea of portioning out the batter to freeze so that I only make a handful of cookies at a time (say 4-6 at a time). I made these recently and while I was making the dough I put the yolks in but it wasn’t making dough…there didn’t seem to be enough liquid so I put the egg whites in as well and they turned out delicious. I’m wondering if others have had this problem? I’m currently in the process of going back and calculating the nutrition information for my older recipes (for the first year I only posted Weight Watchers Points) and unfortunately it’s a time-consuming process! I will try to get this one soon, but if you want the NI before then, you could always run the ingredients through the recipe builder on myfitnesspal.com. That’s how I calculate it! Need the calorie details. I,ve noticed many recipies without?? Plz, we need the calorie counts also. Thank-you for all you do..
Would it be okay to use egg beaters? I didn’t know if you had heard of anyone else substituting it in the recipe. 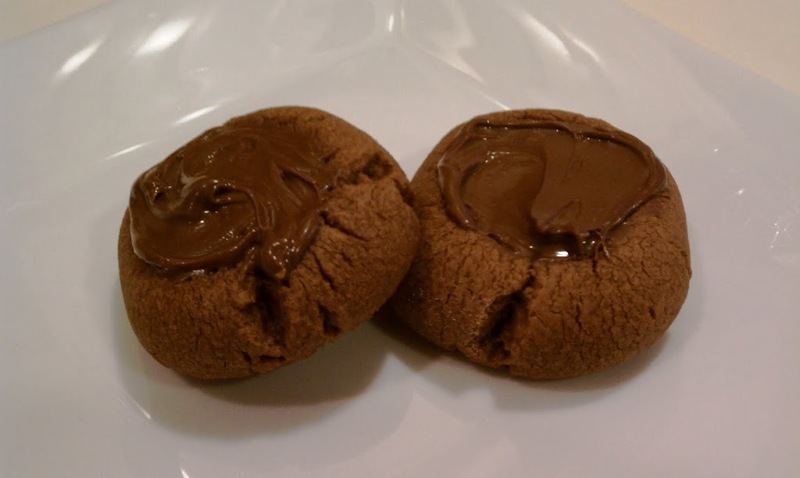 Just made these tonight….they are amazing and my picky husband even loved them! OMG! These sound sooooo good! i can’t wait to make them! These are great! Like a commenter above, the batter was way too dry at first. I had thrown out the egg whites already, so I used a little bit of 1% milk (probably 1-2 T) to make the batter. Delicious! Made these last night…OMG!!!!!! well worth it. Very easy to make. 82 calories, 14g carbs, 5g fat, 1g protein, 1g fiber. But when I run that through a WW calc it says it’s 3 pp+ per cookie, 6 pp+ for 2 cookies, etc. BUT! If you up it to serve 30 people, it takes it down to 2 pp+ per cookie. So I think the fact that it took so little to change it probably means that it really depends on the specific ingredients you use. Either way I feel like 82 calories should really only count as 2 pp+. Anyway, I’m off to make these, they look fantastic! Thoughts on putting these in mini muffin pans to make them perfect circles? I’m thinking of trying it for work. I want them to look perfect. Haha.